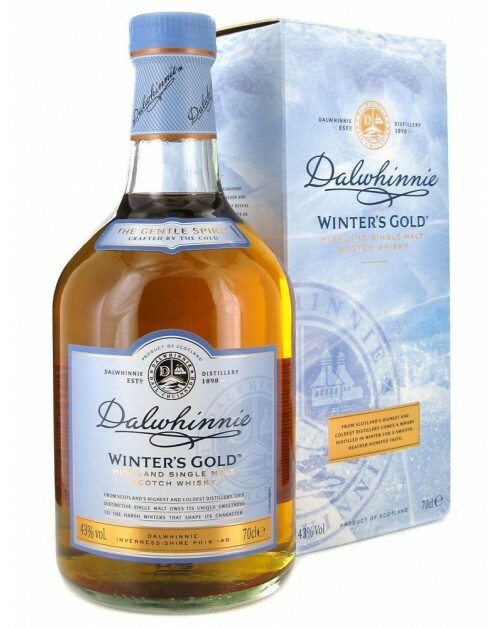 Dalwhinnie Winter's Gold Single malt Whisky is a 2015 addition to the Dalwhinnie Distillery's range. This is an unusual expression in that it is made only using spirit that was distilled between October and March. Dalwhinnie describe this expression as being "Crafted by the Cold". Dalwhinnie suggest that you try serving this whisky frozen! An assertive, spicy, honeyed Dalwhinnie. Nose: Oak, pears, syrup and malt. Then notes of peach and sticky toffee. Palate: Honey with warming spices and cinnamon. Finish: Long finish with nutmeg and smoky malt.